This year, due to family and other issues, I had to turn down the generous offer from my school system and not go to #ISTE2015 on the bus. From Twitter alone, I know that my peeps (#fcsvanguard) are having a great time. What they may not be aware of, is how great a time I can have attending the conference remotely. Through the weekend and into today, I have had commitments away from my computer, but thanks to Jennifer Wagner & Craig Yen I’m hooked into the conference via #NOTATISTE15. She created a Google community and today I attended my first Google Hangout. Yeah! Tech Tools for the Flipped Classroom – I arrogantly thought I knew this but I was wrong. This has tools I had never tried, but will now. And I can already see how to share with my teachers. That’s worth the price of admission. #NOTATISTE15 Live Binders – I have never used a LiveBinder made by an expert before. I have so much to learn about using tools. Much less the incredible amount of information they are collecting and sharing with me. It’s mind-blowing! Tweetdeck can use a Boolean “OR” statement to put more than one hashtag in the column. (To be fair, I learned this Saturday.) Just edit the column and put the word OR (capitals with no punctuation) and then the second hashtag. It works when you’re not sure to follow #NOTATISTE15 OR #NOTATISTE. I remind everyone to remember to sip from the firehose, not stand in front of it and get knocked down. There’s more information than I can absorb OR use during the next school year in just a few hours at #ISTE2015. Learn something, then go back for more. I promise that the information stream will continue, unabated, at full power. It will be there when you get back. Thanks for sharing your #NotATISTE reflections! 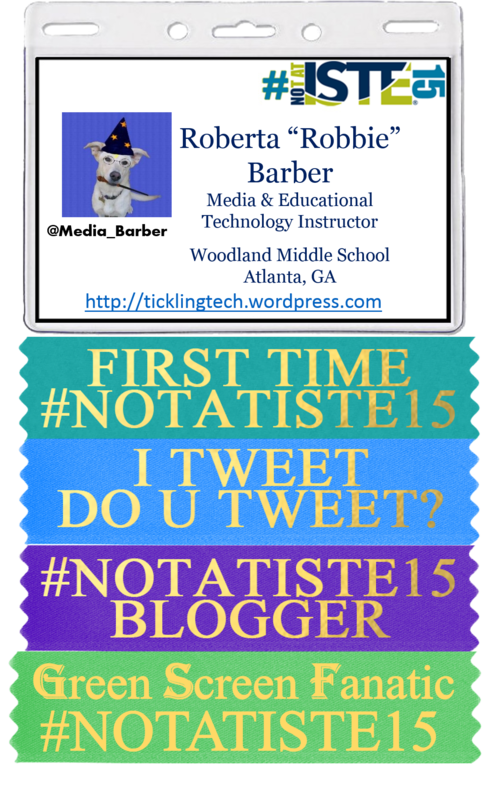 I’ve been to ISTE four times and participated in #NotATISTE twice. While I miss catching up with friends face to face at ISTE I feel I gain more from attending remotely via #NotATISTE Being remote allows me to focus while we are connecting using technology (learning new technology skills) and using technology in a learning context. At a conference it isn’t possible to achieve that same level of immersion. This year I was also able to prove to myself (thanks to a very experienced presenter) that I was also able to present remotely into a session at ISTE without being at ISTE. For me – that was a real highlight. Looking forward to #NotATISTE continue!